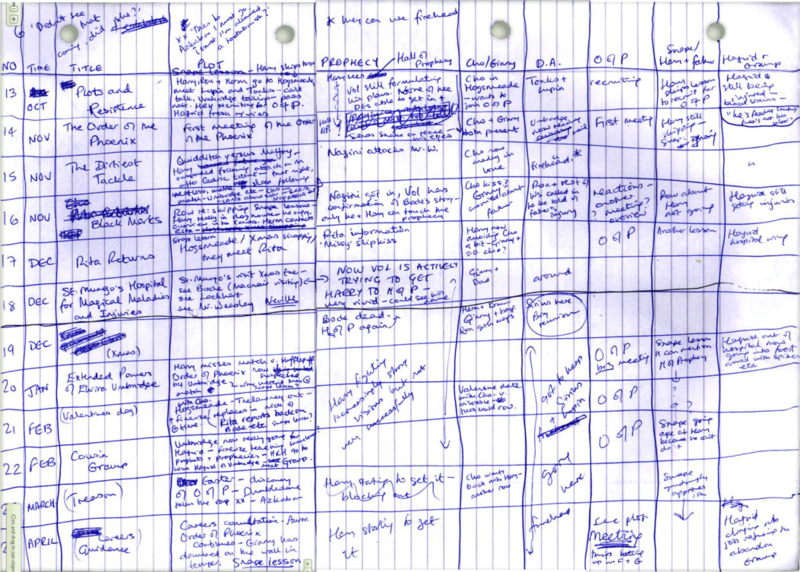 Outlining a novel helps to structure the plot and keep the time line straight. There are many methods and forms. The goal is not to freeze-dry the plot before it is even composed, but to prevent the writer from losing sight of the universe he or she is constructing. There are a variety of strategies for outlining aside from the I., A., 1., a., method. Spreadsheets are an excellent way of visualizing the structure and flow of a novel. 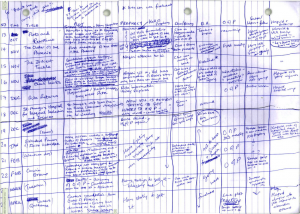 Below is a spreadsheet created by J. K. Rowling, jotted down by hand, wobbly lines and all, on a sideways piece of ruled notebook paper. I lifted the image from the Paperblanks blog. Rowling made columns for chapter number and title, with the corresponding month, a column for plot (overview), and columns for the different plot strands. At a glance, she could see when a character is introduced, at what point critical events take place, and importantly, what else is going on around the same time. She could see how the various subplots were flowing and how they were intersecting with each other and with the main plot. The chart is full of scribbles, arrows, scratches, and insertions. Rowling maintained it as a live document as the writing progressed. The spreadsheet is a very handy writer’s tool, even for novels with only two or three subplots. Rowling worked with a pen and notebook paper, but a writer working in Word or WordPerfect can use the table feature. Scrivener also has tables. And there is always Excel. The virtue of Excel, aside from the ability to build very wide documents, is that you can get pretty OCD with colors and formulas and subworksheets. Here is a link to How to Get a God’s-Eye View of Your Story in Excel from Jeffrey Scott’s blog post on Animation World Network. His example pertains to scriptwriting but is adaptable to novel writing. This entry was posted in Advice for Writers, Story development, Writers' tools and tagged Authors, Outlining a novel, Plotting a novel, Spreadsheet of novel, Writers, Writers' tools on July 29, 2014 by janetlong.